A suspect has been taken into custody and the sheriff will give a press briefing at 10 a.m. Friday. BARRON, Wis. — A Wisconsin 13-year-old missing since October has been found alive, according to the Barron County Sheriff's Department. The department shared on Facebook Thursday night that they've been notified by the Douglas County Sheriff's Department that they have located Jayme Closs alive. "I mean I’m shocked," said Jayme's aunt, Kelly Engelhardt. "It's what we’ve prayed for every single day." Closs, 13, has been missing since Monday, Oct. 15, 2018, when her parents were found murdered at their Barron, Wisconsin home. When investigators entered the home off Highway 8 they found the bodies of James and Denise Closs, but there was no sign of their daughter. 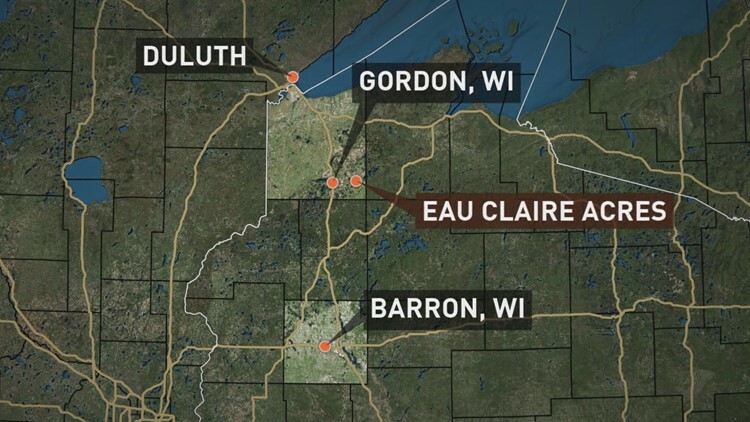 Closs was found at Eau Claire Acres, a small development about six miles east of Gordon, Wisconsin on Highway Y, according to the board chairman from the Town of Gordon. The Douglas County Sheriff's Office said on Facebook that a citizen phoned in the information. KARE 11's Danny Spewak spoke to the citizen who called local police after finding Closs. She was located at 4:43 p.m. on Thursday and a suspect was taken into custody at 4:54, according to Douglas County. "I honestly had faith," Engelhardt said. "I figured if they hadn’t found her by now that the person that did this didn’t want her dead, so I had hope. Every day there was hope. We had too much love and support around us for us to give up." Engelhardt said she believes Closs will be home Thursday night or Friday. She said the family does not believe Jayme is physically hurt that they know of, and that the FBI told the family she is talking and answering questions. Jeff Closs, Jayme’s uncle, said they are in shock. "It was just unbelievable because you hear about … you’re not sure if she’s going to be found. And when you actually hear it, it’s just unbelievable. We’re all just so grateful and happy," he said. "We thought it was going to be a different ending and we’re so happy that you know, hopefully she’s OK, we don’t really know what shape she's in. Or you know, we don't really know a lot, all we know is just she’s alive." "We’ve, you know, had such bad news all the time and everything was so depressing, and now it’s good, it’s hard to even feel good because you’ve felt so bad for so long," Engelhardt said. "When we see her it’ll be different but right now we’re just so happy."